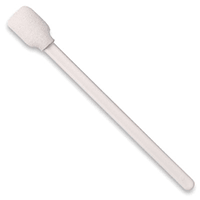 Our largest, sturdiest swab for aggressive cleaning. Ideal for removing stubborn dirt from copier platens, pinch rollers, capstans, keyboards, and more. 0.6 x 0.9" foam tip on 5.0" plastic handle. Packaged in bags of 100 each. Check out our other swabs!